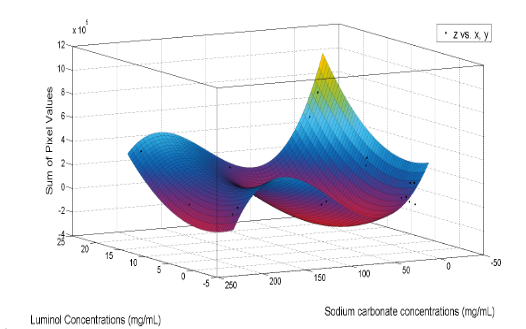 The purpose of this project was to identify the optimal concentrations of luminol and sodium carbonate for maximum light output by using image analysis in order to construct mathematical models in MATLAB, a mathematical software used for analyzing matrices and mathematical data. Many scientists believe sonoluminescence could hold the key to nuclear fusion and since the brightness of sonoluminescence bubbles are tied to the temperatures produced, optimizing the brightness of the bubbles could lead to further progress in the use of sonoluminescence as ignition for nuclear fusion. In the field of sonoluminescence, it is known that solutions of luminol and sodium carbonate enhance the light output by sonoluminescence bubbles. However, no one has conclusively determined the optimal concentrations of these two solvents. Luminol concentrations of 1, 10, and 20 mg/mL, and sodium carbonate concentrations of 1, 10, 100, and 200 mg/mL were tested and their light outputs were measured. The results revealed that the solution of 20 mg/mL luminol and 1 mg/mL sodium carbonate yielded the brightest sonoluminescence cloud. Further research is needed to conclusively determine the optimal concentrations, but the authors of this paper hope this paper may spur on further research and interest in the field. When sound waves travel through water in a controlled and specific fashion, imploding bubbles form in water. These bubbles produce light when they collapse in a matter of picoseconds . This is the fundamental basis of the phenomenon of sonoluminescence. The discovery of sonoluminescence occurred in 1934, at the University of Cologne, when Frenzel and Schultes were working with photographic plates in ultrasonic baths . They discovered multi-bubble sonoluminescence (MBSL), a type of sonoluminescence involving multiple clouds of bubbles. Not much progress was made in the area until 1990, when D. Felipe Gaitan and Lawrence Crum captured a single bubble that produced a glow that was much brighter than the bubbles in MBSL. This was the beginning of single-bubble sonoluminescence (SBSL), which involves only one large bubble, in contrast to MBSL . The discovery of single-bubble sonoluminescence allowed for a more systematic study. Interest in sonoluminescence was renewed in 2000 with the discovery of sonoluminescence produced by Alpheidae, a family of snapping shrimp. Although it only grows up to 2 inches, it is one of the loudest animals in the ocean due to its snaps, which last less than 1 millisecond. These snapping shrimp snap their claws shut, and this action creates a cavitation bubble which reaches temperatures of 5,000 Kelvin . In 2002, Rusi Taleyarkhan at Purdue University claimed that he had evidence of nuclear fusion in sonoluminescence bubbles. Taleyarkhan used deuterated acetone (acetone in which protium has been replaced with deuterium) in his experimental setup and ‘detected’ tritium and neutrons, indicating nuclear fusion, however, Taleyarkhan’s falsified data discredited his research. Thus ended efforts to reproduce his “acquired" results . However, it is now known that sonoluminescence could hold the key to achieving nuclear fusion, due to the extremely high temperatures in the cores of the bubbles (2,000 - 5,000 K in MBSL; 20,000 K in SBSL) as well as the high pressures . There are potential applications for sonoluminescence. Researchers and scientists hope one day to use sonoluminescence to transport anti-cancer drugs to tumors and to destroy toxins. temperature of the bubble can be influenced by different solvents, dissolved gases, and dissolved bases. For example, in the 1990s, it was discovered that alkali solutions of luminol produced strong sonoluminescence, due to excitation of the luminol by the cavitation bubbles. Luminol reacts with basic solutions in water to form a di-anion (a double anion). Hydroxide ions, which oxidize luminol, excite the electrons of luminol. The electrons in luminol then return to their ground state and release photons. These photons have a wavelength of 400 nm, which is the lower range of the visible light spectrum. The solution of luminol thus emits blue light, and the process is called chemiluminescence. An alkali solution increases the solubility of luminol. As a result, chemiluminescence is brighter in basic solutions. Sonoluminescence in luminol solution is called sonochemiluminescence. In this paper however, “sonoluminescence” is used to refer to the phenomenon of sonochemiluminescence. The collapsing bubbles produce hydroxide ions which react with luminol . While many bases are used in sonochemiluminescence, the most commonly used base is sodium carbonate, a weak base with a pKb of 3.67. There are still many unknowns in the area of sonoluminescence. Are there temperature and pressure gradients that takes place inside the bubble? If so, what is the mechanism of action. Many hypotheses have suggested mechanisms for sonoluminescence, but none have been proved. none have been proved. However, it is generally agreed that ionization of the gases present within the bubble produces the high temperatures associated with sonoluminescence bubbles. While it is known that higher concentrations of sodium carbonate increase luminol solubility, and thus, the brightness of the resulting sonoluminescence, the optimal concentrations of luminol and sodium carbonate are not known. Thus, this project aimed at testing different concentrations of luminol and sodium carbonate in order to plot the data and find the brightest solution by analyzing images of the solutions. The purpose of the experiment is to identify the optimal concentrations of luminol and sodium carbonate for the overall brightest sonochemiluminescence solution. If sonochemiluminescence is performed in an aqueous solution of sodium carbonate and luminol solution, of the specific solutions tested, 10 mg/mL of luminol and 100 mg/mL sodium carbonate it will provide the most optimal conditions for bright luminescence as these amounts do not exceed the solubilities of these compounds and will not oversaturate the solution. Previously in the paper, we mention the combinations of solutions tested. These numbers come straight from the combinations. We settled on those specific combinations because we had limited funding and availability so we thought those combinations would be best representative of the range we tested. Construct apparatus for creating sonoluminescence (Images of the apparatus can be found in the Appendix, Figs. 4, 5). Plug the function generator, amplifier, and oscilloscope into an outlet. Connect the function generator to the oscilloscope. Connect the oscilloscope to the power amplifier. Connect the amplifier to the camera. Connect the camera to the computer via USB and to the outlet. Download and install the QImaging software (used to control the camera) on the computer. Mount the transducer and plexiglas container on the metal stand. Connect the transducer to the power amplifier. Pour the control solution into a plexiglas cube. Place the plexiglas cube in the transducer apparatus, turn on apparatus, set camera to use 1-minute exposure, and turn off all the lights. Cover all sources of light that could potentially affect the images. Take three pictures of the control solution. Save as RAW pictures. Repeat the above procedure for 3 other solutions. Take the control solution and add the proper amount of sodium carbonate to obtain S1. Repeat for the three other solutions. Take three pictures for each S1 solution. Add the proper amounts of sodium carbonate to all the solutions to achieve S10, S100, and S200. Take three pictures of each solution. Convert the pictures to TIFF format using ImageJ. In MATLAB, add the three control images together and divide the resulting matrix by 3 to obtain an average of the three images. Name this image “control". For the other solutions, import the three trials into MATLAB, average them, subtract the control image (in order to negate dead pixels), and use the SUM function to find the sum of the pixel values in the image. Record this value for each solution and save the resulting image as “average.tif" in a folder for each solution. To find the mean pixel value of each image, use the MATLAB script in the Appendix. Record these values and calculate the standard deviation of each solution. Figure 1: Figure 1 depicts the amplifier and oscilloscope. 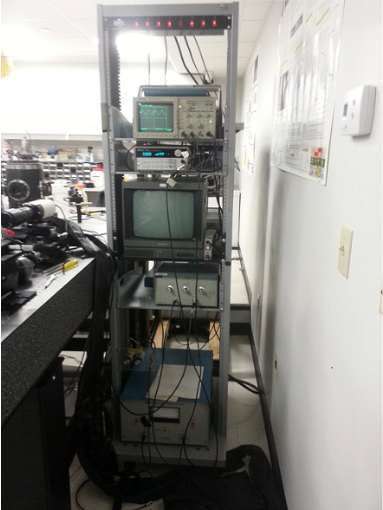 The oscilloscope is the topmost box on the shelf, the transducer is the box just above the television, and the amplifier is the bottom most box. 2Note that the abbreviation “S” represents sodium carbonate, the abbreviation “L” represents luminol, and the numbers represent the milligrams per milliliter of the solute. 3Note that images in MATLAB are processed as matrices, with each element of the matrix representing the brightness of the pixel. Figure 2: Experimental setup, with the camera, stand, tonpilz transducer, and plexiglass cube with solution. The grayscale 8-bit image data were analyzed in MATLAB in order to make models for the data to visualize trends. The models evaluated include Lowess and Interpolant models, which fit the data exactly, and polynomial models, which approximate the information. The SSE and R-square values were evaluated to determine the best models. The models are analyzed in two sections, one for the Lowess and Interpolant models and another for the polynomial models. The Lowess model uses least-square regression, whereas the Interpolant model interpolates points through a Gaussian process.The data values for all the images are recorded in Table 3 in the Appendix. Because of it size, the table is not included in the Results for convenience. Figure 3: This is a trial image of the solution with 20 mg/mL luminol and 1 mg/mL sodium carbonate, which was determined to be the brightest. The white region is the sonoluminescence cloud. All the available Lowess and Interpolant models in MATLAB were used, and the SSE and R-square values are recorded below in Table 1. 4Note that 8-bit refers to the range of possible pixel values. n-bit constitutes a range of pixel values; in this case, 8-bit refers to 256 possible pixel values, with 0 being totally black and 255 being totally white. 5The methods in parentheses denote different algorithms for fitting the data to models. The Interpolant (Cubic Method) model was determined to be the best model, due to having an SSE value of 0 and an R-square value of 1, i.e, all of the data can be accounted for by the model. The Interpolant (Nearest Neighbor) model also had the same R-square and SSE values, but the model had sharp edges because of the model’s algorithm. The Cubic method produced a much smoother curve that is better representative of the data. This model is more appropriate for continuous data. The figure shows the Interpolant Cubic Model. Note that large concentrations of luminol and sodium carbonate did not necessarily provide a very bright solution. To evaluate using polynomial models, quadratic and cubic polynomials were used and compared. The values are recorded in Table 2. After comparing all the models, the system with the highest R-square value was chosen, since the SSE values were all very close. The model with the highest R-square value was the Polynomial (2-degrees x, 3-degrees y, LAR) model. It is shown below in Fig. 5. In both the interpolated and polynomial model, there is a trough around the center of the model. There were no tested sodium carbonate concentrations between 10 and 100 mg/mL or tested luminol concentrations between 1 and 10 mg/mL. Because of the scarcity of data in this region, the trough is not necessarily indicative of a solution in these region. Further testing is needed to evaluate the brightness of solutions in this range. In both models, there is a large spike at (20, 1, 711607). This high point is from solution L20/S1, which in fact had the highest sum in both models. However, the graph stops here. No further luminol concentrations were tested past L20, but the rise at this point may indicate that other solutions beyond 20 mg/mL luminol may exhibit even brighter sonochemiluminescence. Nevertheless, the L20/S1 solution had the greatest sum and the greatest means (in Table 3 in the appendix). L20/S10 was the second brightest, with the second greatest sum and second greatest means. Thus, of the solutions tested, L20/S1 was the brightest, not L10/S100 as predicted. This was perhaps due to the large sodium carbonate concentration creating a cloudy mixture and the medium amount of luminol in solution. While luminol is soluble in basic solutions, sodium carbonate is a basic salt and is not a strong base. In the L10 and L20 solutions with small concentrations of sodium carbonate, a lot of luminol stayed undissolved at the bottom of the solution. These solutions were very opaque as well, which might be the cause of the small image sums. In addition, S100 and S200 solutions were very cloudy as well. While the sodium carbonate dissolved in water, the solution was not transparent. This could also account for the small sums in these solutions. Further testing of the solutions used as well as solutions that were not used is necessary to verify the conclusions. Research of the literature on sonochemiluminescence yielded few results. Hatanaka, Yasui, and Hayashi researched SBSL sonochemiluminescence, but no mention is made of basic salts or bases used in the experiment . The solution of 20 mg/mL luminol and 1 mg/mL sodium carbonate was determined to produce the brightest light, but not necessarily the brightest within the parameters tested, since only twenty solutions were tested due to financial constraints. It is entirely possible that there brighter solutions within these ranges tested. However, of the solutions tested, the solution of 20 mg/mL luminol and 1 mg/mL sodium carbonate produced the brightest solution. The low standard deviations in the data and repeated trials confirmed that a solution of 20 mg/mL luminol and 1 mg/mL sodium carbonate will produce very bright sonoluminescence. Thus, at the moment, the experiment does not support the hypothesis. However, the methodology of this experiment was very basic. More advanced sonoluminescence experiments do not rely on image data but instead on precise instrumentation and advanced equations such as the Rayleigh-Plesset equation and Navier-Stokes equations. These tools were not available, so the methodology had to rely on image data. Thus, these results cannot be very substantive or in any way completely conclusive. More experiments conducted with better and proper methodology are needed. The results of this research have many implications however, from expanding the field of sonoluminescence holds much promise, with potential applications such as bubble fusion to nanodiamond synthesis . This experiment has spawned a number of ideas for potential future research. More concentrations of luminol and sodium carbonate could be tested. It is possible that testing concentrations of luminol greater than 20 mg/mL will reveal more optimal solutions. Concentrations of luminol between 1 and 10 mg/mL should also be tested. The experiment could be conducted using single-bubble sonoluminescence (SBSL). While SBSL is harder to achieve than MBSL analysis would be easier, as the bubble is large and confined to a single region. The experiment could also be repeated with different bases, such as sodium acetate, calcium carbonate, and sodium sulfide. It is known that luminol dissolves better in basic solutions, so highly basic solutions would enable one to use luminol concentrations greater than 20 mg/mL. Noble gases have been shown to increase the light intensity of sonoluminescence. One could test the effects of different concentrations of noble gases in addition to luminol and sodium carbonate to find more optimal solution. This project could not have been successfully completed without the help of the following people. Dr. Glynn Holt, professor and researcher at Boston University, generously provided the use of his laboratory, equipment, as well as much of his time. He assisted in the methodology of the project and suggested the idea of testing luminol and sodium carbonate concentrations. He helped with troubleshooting the data and equipment. He encouraged us and we owe all our success to his generosity. Scott and Ryan, students at Boston University, helped set up the equipment and assisted us whenever we encountered a problem with the equipment. Scott suggested for us to use MATLAB for data analysis, which proved extremely useful. Scott never failed to go out of his way for us, which we deeply appreciate. Dr. Cincotta, our chemistry teacher, helped us develop our ideas and experiments on sonoluminescence. He introduced us to the idea of factorial testing. He ordered our materials for us and helped us prepare for our trip to Boston University. Our parents, who drove us to Boston and back, which required them to go out of their way and leave their jobs. We won’t forget the love they showed us in doing that. Sabina Ohkawa, our friend and statistics student, assisted us with the statistics of our experiment. She explained to us the different types of statistical tests and helped us decide on the best statistical methods to use in analyzing the data. Figure 7: In this image, one can see the amplifier, oscilloscope, and amplifier. The oscilloscope is the topmost box on the shelf, the transducer is the box just above the television, and the amplifier is the bottom most box. Figure 8: This is the experimental setup, with the camera, the stand, the tonpilz transducer, and plexiglass cube with solution. Figure 9: This is a trial image of the solution with 20mg/mL luminol and 1mg/mL sodium carbonate, which was determined to be the brightest. The white region is the sonoluminescence cloud.